夏季猪肉卷是岘港的特产满足即使是最苛刻的美食家. 从常见的肉类，如猪肉制成, this dish has gained a universal reputation in Da Nang and many other regions in Viet Nam. To make the exact kind of roll, the pork chosen must have a balance between meat and fat. It is then boiled until it reaches a certain degree of softness. Boiled pork is sliced and placed onto the plate. 下一个, the vegetables are prepared. They include cucumbers, perillas, 生菜, green bananas and other kinds of fresh veggies. One can either choose the wrapped rolls or enjoy wrapping their own pork summer roll. 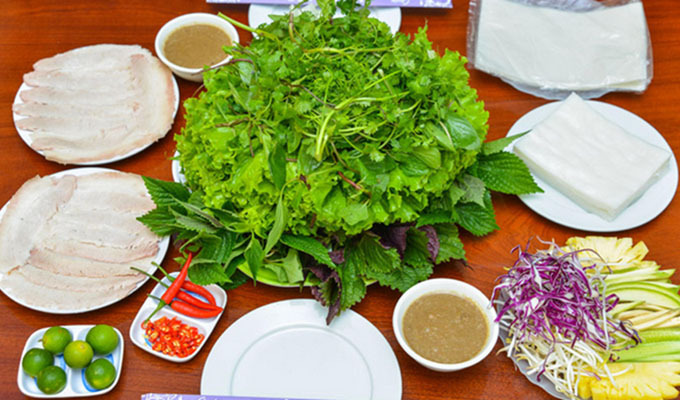 When making your own rolls, make sure that you eat them with the tasty sauce that can only be found in Quang Nam and Da Nang. Even though the ingredients of the sauce (chilis, garlic and pineapple) are easy to recognize, no one can ever discover the secret ingredient of the local people to make this sauce. Last but not least, the pork summer roll dish cannot be completed without a plate of white noodle. The visitors must to eat the rolls and the noodles together to fully experience the real flavor of this specialty.